From 7 to 11 p.m. Saturday, Dec. 31, the Glenwood Hot Springs Pool will be hosting an alcohol-free, family-friendly pool party. GLENWOOD SPRINGS — Children can channel their inner crocodile hunter at Glenwood Hot Springs on New Year’s Eve. The world’s largest hot springs pool is hosting its annual, alcohol-free, last-day-of-the-year, family-friendly pool party on Saturday, with a schedule of aquatic amusements for kids and teens. From 7 to 11 p.m., the Hot Springs Pool will be hosting all sorts of games, including crocodile wrestling. In the wild, crocodiles are some of the world’s most feared creatures with 72 razor-sharp teeth. At Glenwood Hot Springs, the reptiles are toothless and inflatable, making them safe for even the youngest wrestlers. As participants take their turns, judges will score them on their “croc handling” skills and award prizes to the winners. Though crocodile wrestling is the highlight event, the pool has hours of entertainment planned for kids while they wait for the New Year to arrive. Kids, teens and adults can join in the events based on their age group, 6 to 10, 11 to 15 and 16 and older, with prizes awarded to the winners in each category. Toward the end of the evening, there will be a drawing for an annual pool pass, and during the final seconds before midnight, a countdown to 2017. 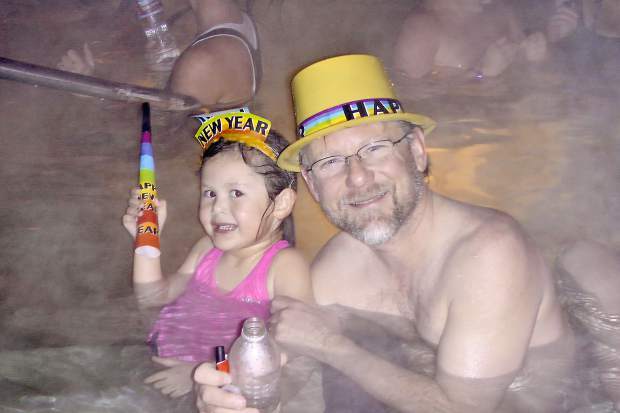 New Year’s Eve is the only night of the year that Glenwood Hot Springs and the Athletic Club stays open until 1 a.m. Find out more and book lodging at http://www.hotsprings pool.com.